A different set of nets and sails. A new siren? Perhaps. Martyn and I are trending to more cruising and less racing. Difficult to give up nimble and fast but like the idea of spacious and comfortable. Moxie is looking for a new home: I think she would still like to race! I put this location on my list for another visit. Lots of dock space, restaurants and five museums ( Art Museum, Museum of Glass, Museum of History, LeMay Car Museum, Seaport Museum, Children's Museum and Chihuly Bridge of Glass) in very nearby area of Tacoma. Perhaps a good spot for a club rendezvous? Matthew said he would help with reserving dock space and coordinating local activities. Could be a lot of fun. 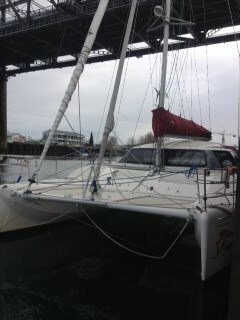 Contact David Miller or Linda Adams (206.406.2615) or Matthew (multihullcompany.com/Office/Seattle-Tacoma) if you are interested. Martyn and I met with Mathew Dunning at the Seattle Boat Show to view the Seawind 1000. Mathew let us ride with him: beautiful, cold, sunny day in Seattle. Spacious and protected with excellent 360* view. Under the bridges and thru the locks to Shilshoal we went. Transited Commencement Bay with a few flakes of snow falling. The Foss Waterway has almost 1/4 mile of guest moorage; perfect for multihulls. A century old restored shipping warehouse houses a maritime heritage educational center just up the gang plank from the guest moorage.